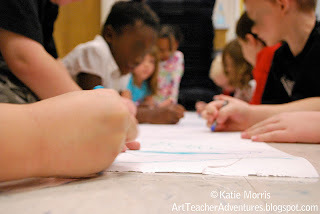 I posted last week about the Art Ed Blog of the Year contest going on over at the Art of Education. Jessica posted the finalists today and I was excited to see that my blog is a finalist! The good part is that you can vote for several blogs, though you can only vote once. I was also really happy to see the three blogs I nominated were in the finals as well. If you have a minute, head on over to the Art of Education and vote for our friends! (which I think I saw for the first time on the Art of Education) after the students told me everything they know about snowflakes (like they are made of ice, come down when it's cold, they are all different). We talked about how there were a lot of different designs made from lines and shapes. I rolled out a long piece of paper on the floor and students who were already done with their previous project went over to draw snowflakes using cool colors. 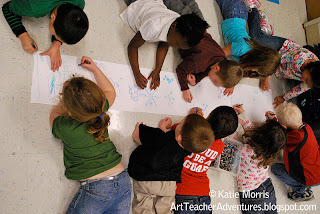 I love how Kinders will automatically lay down on the floor to draw or play with things. For most of the time they worked very nicely together. When more students finished it started getting crowded so I had to ask for some volunteers to go read a book so new students could get a turn. Some switched out and the problem was solved. They really enjoy working together on projects like this. I saw your blog listed and voted earlier today! Good luck! Cool idea I used this print to for an individual project. Love it! Ganz fantastische Idee, die ich gern aufgreifen möchte. Ich mag es.